A former Big Brother producer who invented an inflatable speed camera in a bid to slow down motorists has been warned that he could face seven years in jail if it causes a crash. Shed Simove planned to sell the fake speed cameras - named the Fakeso - for £30 each after commissioning a factory in China to produce them. However, the police has warned him that he could be in contravention of section 22A of the Road Traffic Act 1988 (causing danger to other road users) if his bogus cameras caused a crash - and this carries a maximum prison sentence of seven years. Other concerns raised by the police in an email to Simove included a warning that they might contravene planning regulations, while if they did cause a crash he'd also risk being sued by victims. A number of similar tactics used to slow down motorists have made the news recently - including 'speed gun gran' Jean Brooks who used a hairdryer as an imitation speed gun. Brooks from Hucknall, Nottinghamshire, would regularly stand outside her house and point her hair dryer at passing traffic, claiming it slowed drivers down and improved road safety. 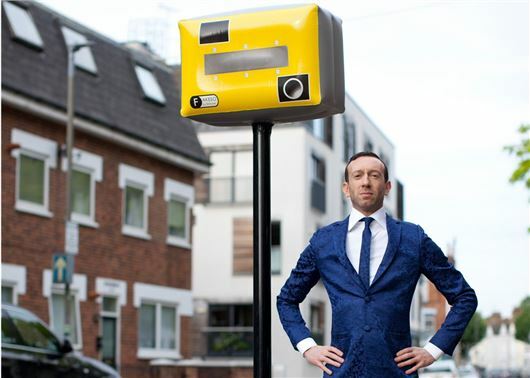 In Worcestershire, a resident went to the extraordinary length of building his own fake speed camera out of drain pipe, ply wood and a mirrored beer mat. Carpenter Jim Dyke built the wooden imitation box because he was so fed up of drivers speeding at up to 60mph past his home. Figures released in 2017 revealed that the number of traffic officers fell by nearly a third over the previous 10 years. If a fake camera could cause an accident, then surely a real one could too. absolutley agree with that, if no one has successfully sued the police how can they sue a private individual. The police just dont want anyone to help slow traffic as it could impact on their " revenue". I suggest we fund the National Health service by taxing speed on the motorways. £25 a day if you average over 75 for more than 5 miles. £50 a day if you average over 80 for 5 miles. No points. Average over 85 get your car crushed. What absolute claptrap! Couldn't agree more with Ben with a Genesis. The trouble with the police is they think the're unbreakable. But they are answerable just as much as the man in the street. If an imitation Speed camera can cause an accident can't a real one?